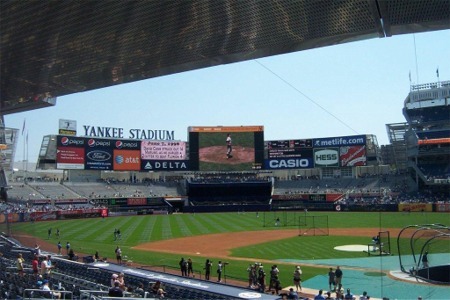 Ok, the Mets were not the only team in New York with a new stadium in 2009; the Yankees also opened up Yankee Stadium III. I did not go to the extreme of buying season tickets, but my fellow Mets fan Vinnie Borriello did do so for investment purposes. I took advantage of that by buying two tickets to 10 games. I did not root for them in any of those 10 games, but I was still happy to be there to experience the new stadium. The good part for me is how easy it was to get to Yankee Stadium from my apartment on 94th and 2nd. It was only a 20-minute subway ride away, so I could easily head home after work, get changed and head up to the game. The first time I made my way up there was against the Rangers on June 4, 2009. Once you get to the 161st Street station, you can see the remnants of Yankee Stadium II and Yankee Stadium III all ready for baseball. Many fans come to the game by subway, so by the time you get off the train you already feel the strong sense of baseball, not to mention all the Yankee fans (and others) ogling at the stadiums from the train platforms. I have to admit that that is pretty cool. I also caught a few games during the final season in 2008, where I was able to get a few photos of both Yankee Stadium II and an unfinished Yankee Stadium III. When you get down to the street level there is more excitement from the fans, the many scalpers, the sports bars, street vendors and souvenir shops that run along River Avenue and 161st St. 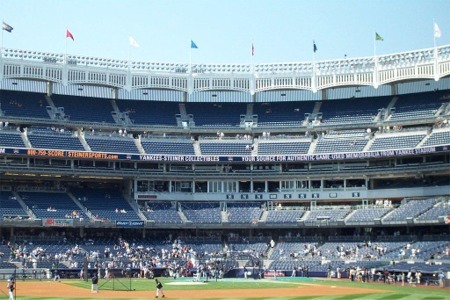 Although Yankee Stadium is not located in the greatest neighborhood, it is an exciting place to be on game days, both inside and outside of the Stadium. 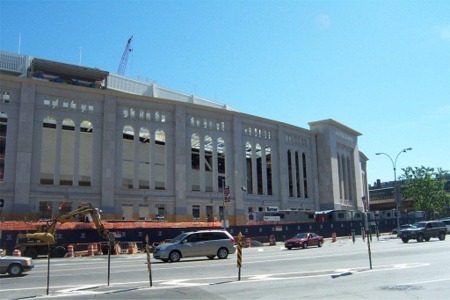 The outside of Yankee Stadium III is much more like the original stadium built in 1923 than the second version, built in 1976. The limestone exterior gives it a bit of a Romanesque feel of grandeur and intimidation that existed prior to 1976, but was missing during the duration of the second stadium. I definitely like the look of this newer stadium much better. Getting in to Yankee Stadium is almost as bad as going through security at the airport. The security guards here tend to think they are guarding the president instead of a baseball field. Be very careful with what you want to bring in with you. If you have food, they will force you to throw away the bag that you brought it in and put it into the clear plastic bag that they hand you. How this helps security and is not a complete waste is completely beyond my comprehension. You would think that once they check whatever bag you have, that bag would be fine, but clearly, I am wrong. However, like most stadiums, bottled water is the only permitted outside beverage, which is fine…as long as you do not have it in a non-clear bag. Once you get past security, it all gets a lot better. I walked in through Gate 6 into the Great Hall, which is clearly great. I immediately realized that this New York team understands its fans and the history of their team. The Great Hall is seven stories high and has banners of past players, including Catfish Hunter, Thurman Munson, and my personal favorite, Dave Winfield. There was also a giant poster of Reggie Jackson on one end of the hall. My favorite part though, was that the part of the outfield wall with the 385 foot sign from Yankee Stadium II was on display. There are also souvenir stands and an LCD screen to show all things Yankee all over the place. There was no doubt from the moment I stepped foot inside the stadium, that this was the home of the Yankees, which is exactly how it should be. I only wish Wilpon and the Mets understood that for the Mets and their fans. This is clearly an instance where the Yankees come out on top. From the Great Hall, I made sure I went right to Monument Park. If you do not come early, you will likely miss that part of the Yankee Stadium experience because it closes 45 minutes prior to game time. Sometimes you can end up being on line for a long time without ever making the time cutoff to get inside the park. I made sure I was there in time. 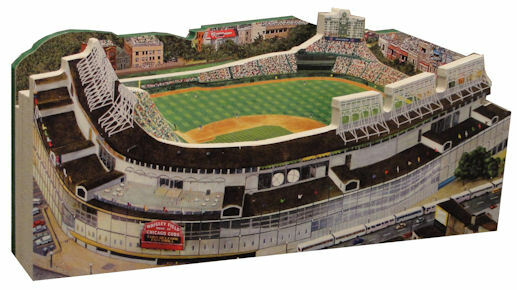 Like in the previous renditions of Yankee Stadium, Monument Park is located in center field. It is between the two bullpens and is underneath a sports bar (which doubles as the batter’s eye). The Yankees do a great job of celebrating the stars of their past with huge monuments plaques, and their multitude of retired numbers in baseball circles within Monument Park. The six huge monuments that highlight this section are for Babe Ruth, Lou Gehrig, Miller Huggins, Mickey Mantle, Joe DiMaggio, and George Steinbrenner. There are 27 plaques for great players and managers including Casey Stengel, Phil Rizzuto and Yogi Berra. There is even a plaque to honor those lost on 9/11, which is a great touch. 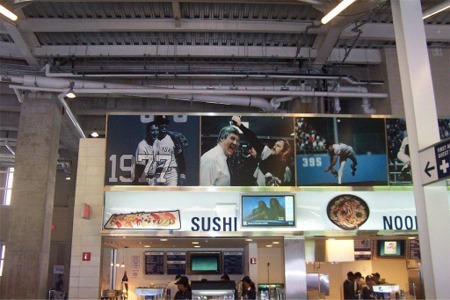 I love this tribute to the past greats, but have to say that Monument Park was better in Yankee Stadium II. There was more room to see the monuments in the prior stadium and the guards did not rush you through as quickly. An interesting twist to Monument Park, is that Mariano Rivera (who will be enshrined here some day), requested that there be access to Monument Park from the Yankees bullpen during the game, and they granted his wish. I love the fact that the best Yankee of his generation has such a tie and sense of history of the team that he wanted access whenever he could. After leaving Monument Park, I took my traditional loop around the stadium. Every step I took, I was more impressed with the Yankees sense of history and disappointed with the Mets lack of it. All around the field level concourses there were photos of past Yankee highlights on a season-to-season basis (I focused on 1977 & 1978, which is when I was first a big baseball fan). These photos are part of the Daily News sponsored “Glory of the Yankees Photo Collection”. I love every bit of this; a new fan can easily get a quick tutorial on the Yankees history by walking around the concourse. I also find it funny and apropos that, the Daily News sponsors these photos. I have always referred to that paper as the Yankee Paper, because their year-round focus is on the Yankees, but they will never say a bad word about them. The concourses are also extremely wide and comfortable to walk through. The concourses at Yankee Stadium II were by far the worst in size, shape, and cleanliness, so this is a huge improvement. The other great thing about the concourses is that from most angles you can easily see the field, action and scoreboards (unlike at CitiField). On principal, I had to check the bathrooms, which I immediately noticed were huge with lots of urinals (again, unlike CitiField). This way the fans can be in and out quickly without missing any part of the game. As far as food goes, Yankees Stadium III is much more expensive and not as good as in CitiField, and that will be the rare nod I give to CitiField. I like the cheesesteaks, and sausage and peppers here, but the cardboard pizza and other typical ballpark fare are not very impressive. There is the Hard Rock Café tourist trap that is there all year round, which is so-so food with great decorations. It is a nice feature that you can go there on non-game days to see the field though. There is a wide variety of food and a decent selection of beer, but the prices are so high it is not worth it, unless you go for the cheesesteak. In taking an inward look at the stadium from a field perspective, it is a beautiful field. They tried to keep many of the old stadiums’ features, and did a fairly good job at it. 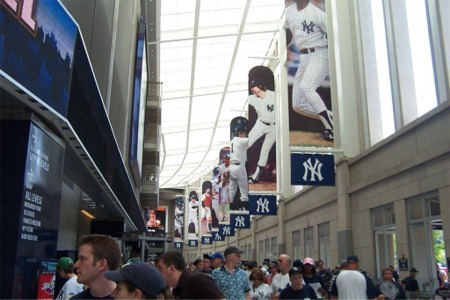 The white friezes along the upper deck stands are reminiscent of the original Yankee Stadium and look great. The seats are the same blue color and when looking from center field towards home plate, it really does look like Yankee Stadium II, except the upper level seats are not quite a close to the field as they once were. All the retired numbers are also up on the wall below the giant Yankee Stadium sign in left center field, while all the pennants are located in right center field. Again, the Yankees understand their history and share it with their fans. The in-game scoreboard is located on the left field wall and is simple, but perfect for what is needed. The rest of the stats show up on the big screens during the game. The out-of-town scoreboard shows up on the right center field screen and displays only two games at once. This also shows that the Yankees get their fans, since if it is not the Yankees, they do not really care, so there is no reason to waste space with the scores from every game. If you do care, you just have to be patient enough to look when the score that matters appears on screen. The last key piece to the Yankees celebration of their history is the Yankees Museum, which is located on the first level by Gate 6 ramps (which surprisingly had cracks in the cement already). Unfortunate ly, I did not have enough time to see the Museum on my first visit, because I did not want to miss any of the game. Fortunately, the museum is located right under the seats that I would use for 10 games, so I had the opportunity to visit on my next trip. It is a small museum, but absolutely worth a visit. There is plenty of Yankee memorabilia of all eras inside, but the biggest draw may be the Wall of Balls, which is a wall that includes hundreds of autographed baseballs of past and present Yankees. The other great feature is the Don Larson perfect game exhibit. There is a statue of Don Larson Pitching and another one of Yogi Berra catching (behind a home plate) 60 feet 6 inches away. The Museum is open during the game, so fans can visit for many ours once the gates are open. My brother-in-law Al DiCanio joined me for this game, but he drove, so we met at the seats. Al is one of the biggest Yankee fans I know and he loves the game and follows all the teams as much as I do. Therefore, we can talk for hours about baseball even though we do not root for the same team. Our seats were in Section 410, which was in the upper level near the right field foul pole. We are pretty far away, but still have a decent view of the game. I know the Yankees got knocked hard for having some seats at exorbitant prices, but many seats in the upper level are affordable. I did not mind sitting there for ten games at all. However, another friend of mine had a multigame package with seats in section 306, which were awful. She could not see much of right field because of the lower seats in the stands blocking her view completely. Most seats were angled properly towards home plate, but there are some sections with awful sight lines. Finally, I get to game time, but before the game actually starts, I have to bring up one great thing and one awful thing about games at Yankee Stadium. The awful thing is that they almost never have a live person sing the Star Spangled Banner before games unless it is opening day or the playoffs. I have been to baseball games at every major league stadium, many minor league stadiums (including Independent Leagues), and never have I been to a nother stadium that had a recording for the National Anthem instead of a live person. I could say the same of the 50-60 different stadiums that I have been to for other minor league and major league sports. I find this very disappointing that a team that spares all costs will not spare this one. The great thing is the roll call by the fans in the bleachers (bleacher creatures). At the start of every game, the bleacher creatures chant at the names of the starting position players one-by-one until they have called out all nine players. The players usually nod, wave, or acknowledge the fans in some unique fashion (see Swisher, Nick) after their name is called. This is a fun tradition that players and fans alike treasure. The game was between the Yankees and the Texas Rangers. Chien-Ming Wang started for the Yankees and retired the Rangers in order for the first 2 innings. The Yankees leadoff hitter, Johnny Damon, was nice enough to display Yankee Stadium III’s small dimensions to me. Batting from the left side, he hit what he though was a popout to right field off Brandon McCarthey. After he hit the ball, he dropped his head in frustration, thinking he was out, but the ball was out instead. It sailed over the short right field fence for a home run and a 1-0 Yankee lead. I found out first hand that the bandbox theory was true. The good thing for the Yankees though is that they hit a lot more home runs in this bandbox than their opponents did. The Rangers got on the board with 2 runs in the 3rd when Chris Davis doubled, moved to 3rd on a sacrifice bunt by Taylor Teagarden, and scored on a wild pitch by Wang. Ian Kinsler would also walk and eventually come around to score on an RBI single by Hank Blaylock, which put the Rangers ahead 2-1. The Rangers added another 2 runs in the 4th on a 2-run double by Davis and another in the 5th on a home run by Nelson Cruz. Cruz’ home run gave the Rangers a 5-1 lead and knocked Wang out of the game. However, the Yankees came roaring back in their half of the 5th. Francisco Cervelli and Ramiro Pena opened the inning with back-to-back singles, which were followed by back-to-back walks to Johnny Damon and Nick Swisher to plate the first run. Mark Teixiera followed that up with a 3-run double to tie the game up an d knock McCarthy out of the game. Alex Rodriguez finished the scoring in the inning by bringing home Teixiera on a single off Jason Jennings to put the Yankees up 6-5. The Rangers were not done either though. Ian Kinsler homered off Alfredo Aceves to tie the game up at 6-6. I have to interlude away from the game for the 7th inning stretch. I will start by stating that I am a very patriotic American, but also an Atheist at the same time. However, the one religion that I do follow is Baseball, and with that religion, the most important tradition is to sing Take Me Out to the Ball Game during the 7th inning stretch. Unfortunately, at Yankee Stadium, they always play God Bless America, which infuriates me as both an Atheist and a Baseballist. Therefore, I head for a restroom break during the 7th inning stretch at Yankee games. Luckily, I get back in time for Cotton-Eyed Joe, which still confuses me as to why this country song is popular in New York City. I will not even mention the YMCA tradition by the grounds crew, but maybe I am just a crusty traditionalist there too. Back from the interlude. The Rangers were shut down in the 7th and 8th innings by Phil Coke and David Robertson, while the Yankees added 2 runs in the bottom of the 8th on a 2-run homer by Melky Cabrera off CJ Wilson. The only thing left from there was to listen to Metallica’s Enter Sandman blasting through the stadium’s loudspeakers, while the greatest closer of all time, Mariano Rivera, walked in from the bullpen to the mound. To no surprise, Rivera held the Rangers scoreless to preserve another Yankees win. 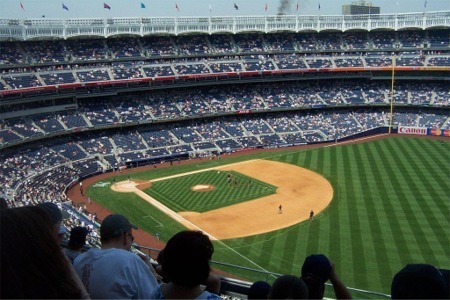 Bottom line – Although I am a Mets fan, I am quickly becoming a much bigger fan of Yankee Stadium III than I am of CitiField. 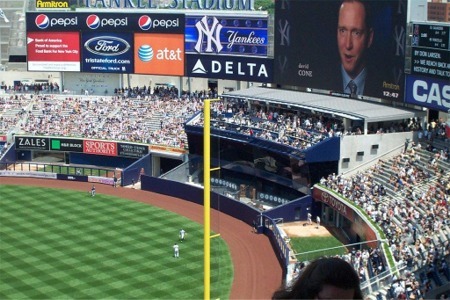 I know many Yankee fans are not as pleased with this new stadium as I am. They lost their nostalgia with the stadium that they grew up with, unless they grew up prior to 1974, when the Original Yankee Stadium was demolished. I did not have this emotional tie. Therefore, I think the new stadium is a tremendous improvement.